As I mentioned in my post about the ship manifests, Betty Goldschlager was released from Ellis Island to someone she identified as her aunt, Tillie Srulowitz. I had no idea who this could be when I first saw this many months ago. 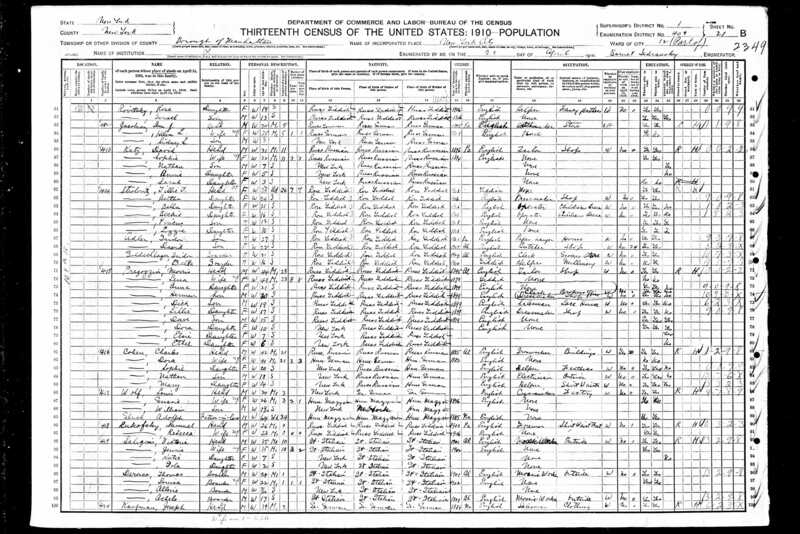 In reviewing my Goldschlager research this past week or so, however, I looked more closely at the census report from 1910, as seen below. Isadore and “Bella” Goldschlager are listed as boarders living with….Tillie Strolowitz and her many children. When I first looked at this, I had no idea who the Strolowitz family was and just assumed that Isadore and Betty were living there as boarders, not relatives. This time I remembered the name on the ship manifest and made the connection: this was the aunt that met Betty at Ellis Island. So who were these people? Tillie was listed as a widow and had five children named Strolowitz: Beckie, Bertha, Bella, Lizzie and Pincus. She also had two sons with the last name Adler, David and Isidor. I assumed David and Isidor were children of a first marriage, and the others children of her second marriage, but since David is younger than Bertha, that did not make sense. Of course, knowing how unreliable census reports are, it is also likely that that is just an error and that David was in fact older than Bertha. The census also reports that Tillie’s present marriage was 26 years old, but I don’t know whether that means she’d been married to Mr. Strolovitz for 26 years when he died or whether it had been 26 years since she had married him. All her children named Strolovitz were younger than 26, whereas Isidor was 27. I then decided to see what I could find about the Strolovitz family and the possible connection to the Goldschlager family. On the Ellis Island site, I found entries for two sisters, Betty and Bruche Strulovici from Jassy, who arrived together in 1906 on the Noordam when Betty was 17 and Bruche was 20 with thirty dollars between them. 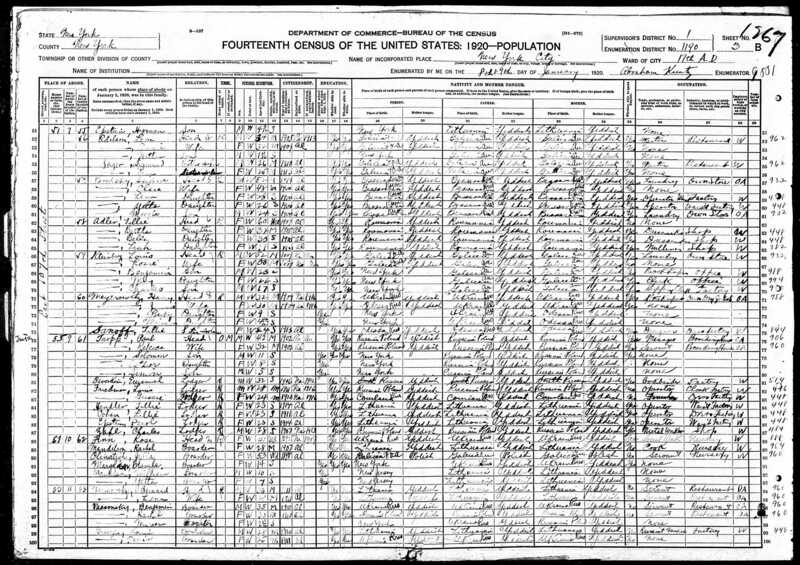 That information matched the ages and dates of arrival for Bella and Bertha Strolovitz on the 1910 census, so it could very well be them. I so far have not been able to locate any other Ellis Island records for Tillie Strolovitz’s family. When I searched for later US census records, I could find almost nothing at first for anyone named Strolovitz with similar first names or for Szrulowitz or Strulowitz or any other reasonable variation. I then turned to search for David and Isidor Adler and ran into the problem of too many people with those names and no certain way of determining which ones were Tillie’s sons. I think I have narrowed it down, but am still not certain that I have found the right David or Isidor. Tillie, Bertha, Bella and Leah Adler, listed as mother and daughters, of the approximate ages that Tillie Strolovitz and her daughters would have been in 1920, from Romania. This seemed too unlikely to be a coincidence, and I feel fairly certain that for some reason, Tillie and her daughters had changed from being Strolovitz to Adler. I could not find any records under either last name for Tillie or the daughters, except for death certificate for a Tillie Adler dated 1925 for a woman of the correct age. I have ordered that certificate and will wait to see what it contains. Having concluded that Tillie and her daughters were now using Adler, I thought that perhaps her son Pincus had also switched from Strolovitz to Adler, so I searched for him. 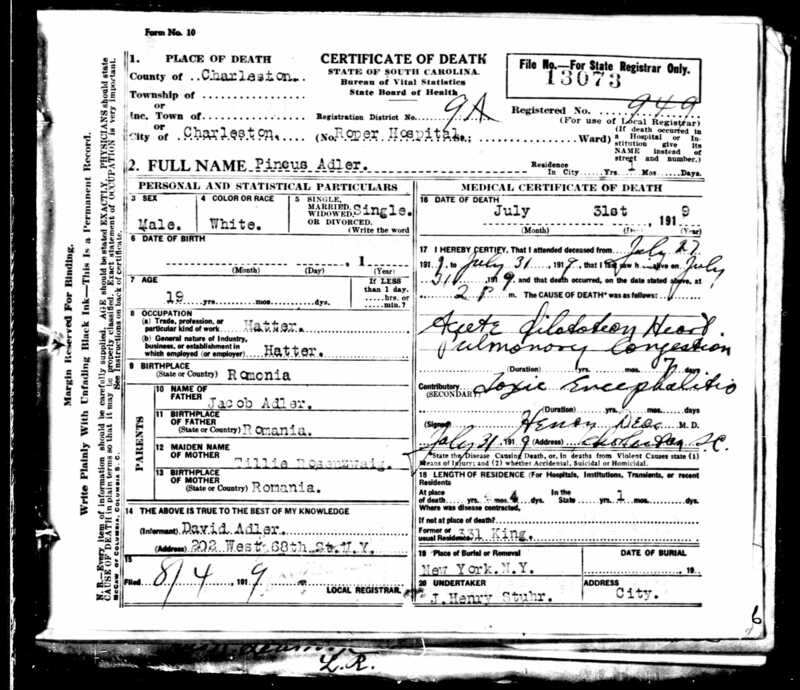 I found a South Carolina death certificate for Pincus Adler dated July, 1919, age 19, born in Romania, whose father’s name was Jacob Adler, and whose mother’s maiden name was Tillie Rosensweig. The informant on the death certificate was David Adler of West 68th Street, New York, New York. I am fairly certain that this is the same David Adler and the same Pincus Strolovitz AKA Pincus Adler, although the age may be off by a year or so (not anything surprising in these records). Everything else lines up: mother is Tillie and brother is David Adler from NYC. Pincus Adler was also buried at Mount Zion cemetery in Queens, not in South Carolina. Perhaps Pincus ended up in South Carolina after World War I. I’ve yet to find a draft registration under either name, but am continuing to look. So why does any of this matter? When I first saw what Tillie’s maiden name, it didn’t mean anything to me. Like so many other times in the research, I had to move away from it. Several hours later, while doing something completely unrelated, a lightbulb went off. Rosensweig was Gisella Goldschlager’s maiden name also! Gisella and Tillie were sisters—Tillie, after all, was listed as Betty’s (and thus, David’s and Isadore’s) aunt on that Ellis Island form. 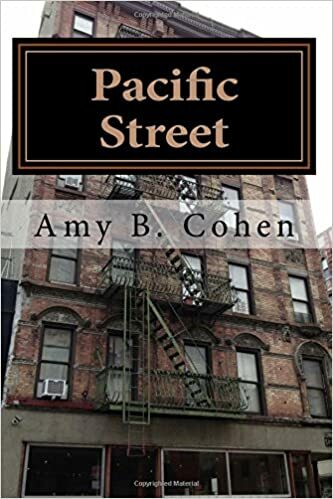 Her children—Bertha, Bella, Beckie, Pincus, Lizzie, David and Isidor— were my grandfather’s first cousins. I still have more work to do to figure out the Strolovitz/Adler family. Why did they use two different last names? I found a Tillie Strulowitz buried at Mount Zion on August 4, 1925, the day after the date of death for Tillie Adler; this must be the same person, but one place she is Adler, the other she is Strulowitz. Why is Jacob Adler listed by David Adler as Pincus’ father? Was there ever a Mr. Strolovitz or was Jacob Adler the father of all seven children? Why did Tillie switch back and forth? Why did her daughters become Adlers? This stuff just never gets boring to me; there is always another mystery, another surprise around each corner. This entry was posted in Goldschlagers, Miscellaneous information and updates, Rosenzweigs and tagged Adler, cemeteries, Death certificate, Ellis Island, Family, genealogy, Romania by Amy. Bookmark the permalink. Fascinating story; so many little mysteries that add up and create an even larger one. Good luck with your research – look forward to the “next installment”! Thanks! Glad you are enjoying it. I am researching the next installment right now! It’s funny—I’ve never been very much into mysteries or police shows, but now I understand why detectives get satisfaction out of solving a case.